Game updates, announcements, discussion, sign ups, player newspapers, out of character chatter, and more. 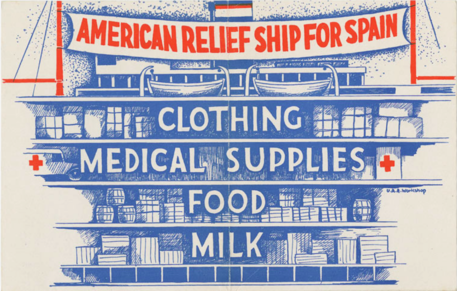 WORLD FOLLOWS AMERICA'S LEAD, HUMANITARIAN HELP FOR SPAIN. Following a statement by the State Department, impetus has gathered behind international efforts to supply humanitarian aid, primarily food, to beset civilians in Spain. With popular feeling against any substantial involvement in the conflict, little more seems likely. GOVERNMENT ANNOUNCES ARMS EMBARGO, CIVILIANS ATTEMPT TO ESCAPE SPAIN. President Roosevelt today made clear that an embargo would be enacted against the conflict in Spain to prevent American arms and American companies being embroiled in the fighting. Proposals are also in the works that new visas may be issued to skilled workers attempting to flee conflict-stricken areas of Europe, although Congressional leaders made clear any actions would remain within the current immigration law. BUSINESS WELCOMES NEW SOVIET TRADE DEAL. Following recognition of the USSR and 3 years of intense lobbying by business leaders, a new trade deal has been struck with the Soviet Union. Economists predict that the renewed surge in exports to that country will continue to drive the domestic industrial recovery spurred by the President's New Deal program. DEAL STRUCK IN SOUTH CHINA SEA. After brief negotiations with France, the US has established its claim to an island chain in the Luzon Sea. Statements by the Department of the Navy suggest that new meteorological stations will be build to watch for weather conditions and help monitor free trade in the area.